To live and die in Skyrim will become a much more involved affair when a new, official Survival Mode for Skyrim Special Edition arrives in October. Bethesda will introduce the new mode via the Creators Club, which lets players pay for professionally made extra content (so basically DLC mods), though it will be free to try out for the first week after launch. If you've played Fallout 4 in Survival Mode, many of the mechanics will already be familiar to you: you'll get hungry if you don't eat enough, giving cooked food a much more important role in the game; you'll get tired if you don't sleep enough, but only a cosy bed indoors will counteract all of your weariness; diseases are more prevalent and potentially debilitating, and now they're harder to get rid of. 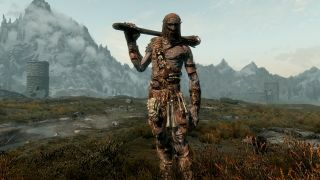 It's awfully cold up there in Nord Country, so Skyrim Survival Mode will also introduce a warmth system. Different regions will chill you faster than others, as you can see in this map (click the button in the upper right to go full screen). Keeping a warm set of armor on hand will be essential. Once again, there's some Creation Club versus mod weirdness going on. Campfire and Frostfall are two of the more popular mods for Skyrim and they already implement a pretty thorough warmth system, including options to stay warm by wearing certain armors, by drinking hot soup, or by simply lounging around a roaring fire. Players who enjoyed those mods will probably feel a bit weird paying for similar mechanics again. On the other hand, it sounds like Survival Mode will have a broader remit in terms of changing the game than most individual mods. You could probably cobble together a bunch of pre-existing mods to create a pretty good facsimile Survival Mode - there are a lot of Skyim mods out there, after all - but there's no guarantee they'd all be compatible or balanced with each other.